The EA consultation on navigation charges for 2019-21 closed yesterday. The TMBA submitted a formal response on behalf of its members and we await the outcome with interest. The consultation itself raised several issues which we intend to pursue, not least how it was promulgated and the the form and value of many of the questions. As we have stated previously, members of the TMBA are happy to pay reasonable charges for their enjoyment of a much valued navigational resource and understand the need to address the major shortfall in funding. However, we are not happy that we are being asked to support significant, above inflation, increases when many craft on the waterway are evading the payment of registration fees and many other current opportunities for revenue collection are not being diligently pursued. count. Far too often boaters tend to just shrug their shoulders and the result is that the EA claim they must be content as they have not indicated otherwise. Because this is a public consultation responses will be from all complexions of river users. Boaters really do need to ensure their views are well represented. 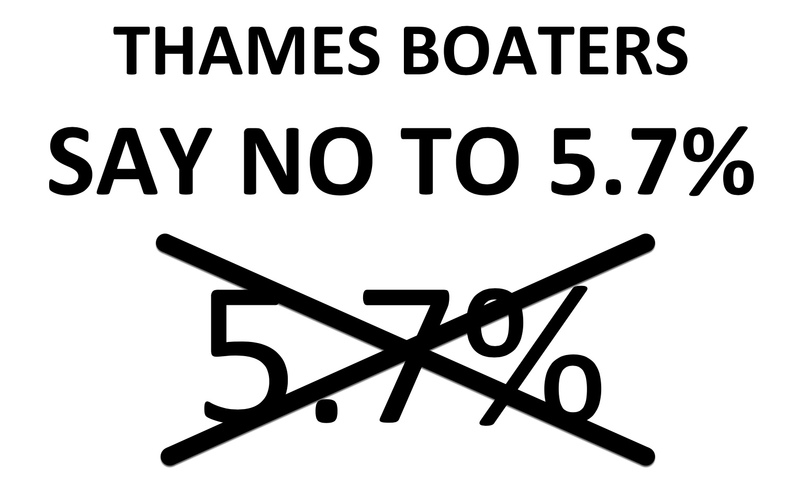 The previous consultation prior to this years 5.7% increase attracted just 870 responses IN TOTAL many of which were from non boating interests. There are over 8,000 powered craft owners registered on the Thames – Imagine how these results would have been impacted if even 1,000 of them had bothered to respond ! Note that just 191 said that lockside assistance was important and only 125 wished for more river patrols. We all know that this is not a true representation of boaters views. If ever there was a time for boaters to unite and demand change in the way the river is funded and managed it is now. Please , please don’t just let this opportunity to be heard pass you by. Respond yourself, encourage other boaters you know to respond, make sure everyone in your club responds. Fairly represent your personal views but DO IT ! We can make a difference ! The EA public consultation itself, on proposed navigation charge increases for 2019 to 2020 and 2020 to 2021, is now live on the gov.uk website. You can access it HERE . Click on the link in the blue box which says ‘The consultation is being held on another website’. When you get to the overview page, scroll down to the bottom and click ‘respond online’. 12 July 2018 – More Registration Charge Increases Proposed ? TMBA is concerned to learn that the EA are about to open a consultation which will propose increases in Thames registration charges of 5.7% p.a. for 2019 and 2020. Other waterways users will be faced with even higher increases. It is time to recognise that the current charging regime is unfit for purpose and needs to be completely reviewed. These are no longer registration charges but a direct tax on those who now contribute the lions share of river funding, particularly powered craft boaters. The Defra minister with responsibility for waterways, Therese Coffey, recently decided not to accept a proposal to transfer the rivers to the Canal and River Trust and to leave responsibilty for these waterways with the Environment Agency. However, if the EA is to be able to fulfil this duty they clearly must have access to the resources they require. Government must release the Environment Agency from the shackles of outdated legislation and Treasury rules and give them the freedom to seek new and alternative funding streams. Everyone who uses, enjoys and profits from the river needs to contribute but government also needs to recognise that infrastructure and public safety issues will require a continuing significant level of public purse funding. We understand the consultation will be published on July 16th and will comment further once we are aware of the detailed content. Posted in Funding, Latest News	| Comments Off on 12 July 2018 – More Registration Charge Increases Proposed ?